Pierre Richard (born Pierre-Richard Maurice Charles Léopold Defays; 16 August 1934) is a French actor, film director and screenwriter, best known for the roles of a clumsy daydreamer in comedy films. Richard is considered by many, such as Louis de Funès and Gérard Depardieu, to be one of the greatest and most talented French comedians in the last 50 years. He is also a film director and occasional singer. Pierre Richard was born in a Bourgeois family from Valenciennes. He is the grandson of Léopold Defays who was the director of the company Escaut-et-Meuse. His name comes from the stage name of Pierre Richard-Willm who was his mother's favorite actor. Pierre Richard spent his childhood and a part of his teenage years in his native city where he was a student at the Henri-Wallon high school. Skipping regularly the classes to go to the cinema, it is Danny Kaye in Up in Arms that revealed his vocation. This being received with a moderate enthousiasm by his family, he had to learn a real profession. He then studied kinesiotherapy without renouncing at the spectacle field. Pierre Richard started his career at the theater with Antoine Bourseiller and producing himself in famous cabarets from Paris, where he played his first sketches written with Victor Lanoux. He then began his film career in 1968 in the film Very Happy Alexander directed by Yves Robert. In 1970, he directed his first film Le Distrait, followed by Les Malheurs d'Alfred (1972) and I Don't Know Much, But I'll Say Everything (1973). He worked again with Yves Robert for the film The Tall Blond Man with One Black Shoe (1973) and its sequel The Return of the Tall Blond Man with One Black Shoe (1974), both written by Francis Veber, who then casted him as the main role in The Toy (1976), his first film as a director. Francis Veber and Pierre Richard began a successful partnership in the early 1980s, highlighted by the three successful comedies La Chèvre (1981), Les Compères (1983) and Les Fugitifs (1986), which paired Richard with Gérard Depardieu. Richard moved again behind the camera to direct On peut toujours rêver (1991) and Droit dans le mur (1997). Les Fugitifs, a manager unemployed for three years, father of a five year old girl, failing a hold-up and forced to leave accompanied of a former burglar (Gérard Depardieu). Since 1986, Pierre Richard is also a businessman and winemaker. He owns the restaurant Au pied de chameau in Paris and a 50-hectare vineyard which produces some 80,000 bottles a year (red and rosé) labelled as Château Bel Évêque in Gruissan in the department of Aude. Married and divorced three times, he has two sons who are both actors are musicians, Olivier is a group member of "Blues trottoir" and plays the saxophone whereas Christophe plays the double bass. His grandson, Arthur Defays, is a model and actor. Note : Pierre Richard has played in all the films he has directed. Pierre Richard (1989). Olivier Orban, ed. Le petit blond dans un grand parc. 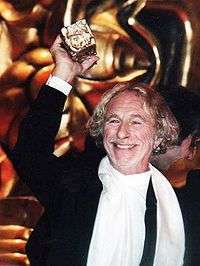 Pierre Richard (2003). Cherche-Midi, ed. Comme un poisson sans eau, détournement de mémoire. Pierre Richard; Gwendal Le Bec (2010). Gallimard Jeunesse Giboulées, ed. Le petit blond avec un mouton blanc. Paris. p. 75. ISBN 978-2-07-062104-0. Pierre Richard and Jérémie Imbert, Je sais rien mais je dirai tout (autobiography). Preface by Gérard Depardieu. Éditions Flammarion, 2015. Un jour, un destin : Pierre Richard, l'incompris (A film by Laurent Allen-Caron). Broadcast on France 2 on 6 September 2015 and again on 31 December 2015. ↑ "Pierre Richard : tendre inadapté". Les Échos (in French). 7 May 2015. 1 2 "Pierre Richard, l'incompris" (in French). France 2. Retrieved 6 September 2015. ↑ "L'école buissonnière a réussi à Pierre Richard". La Voix du Nord (in French). 25 April 2010. ↑ "Château Bel Évêque" (in French). Gault Millau. Retrieved 5 August 2016. Wikimedia Commons has media related to Pierre Richard.